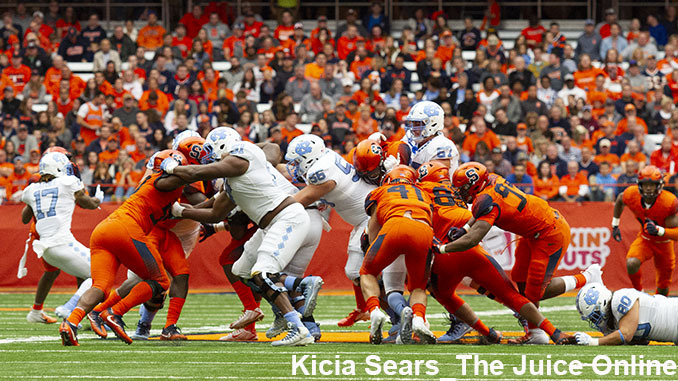 Syracuse's defense stops North Carolina in the first half. Mandatory Photo Credit: Kicia Sears, The Juice Online. Item: The ACC released the 2019 composite football schedule for its 14 teams on Wednesday. The immediate highlight for Syracuse is week three, Sept. 14. The Orange players, most returning from a historic-for-the-program 10 win season, will find big, bad Clemson, the team it beat in 2017, and came closest to knocking off in ’18, headed to what will undoubtedly be a scorching hot and uncomfortable Dome filled with a lot of people wearing orange clothing. Where does Syracuse football go from a return to national relevance, a No. 15 final A.P. ranking, a bowl game victory and a ton of postseason accolades? Well, literally, it will be to Lynchburg, Va. on Aug. 31 to meet FBS relative newcomer Liberty in the season opener, exactly one year to the day that the 2018 season started with a bang in Kalamazoo, Mich. beating Western Michigan. *Syracuse meets Liberty for the first time ever in a 2-for-1 deal, the game in Lynchburg then two in the Dome the next two seasons. The Flames welcome first year head coach Hugh Freeze formally of Ole Miss. *Another new coach will be on the sideline the following week when the Orange travels to Maryland. Mike Locksley left Alabama to try and rebuild the Terrapins program after the disastrous tenure of D.J. Durkin. It will be the first time SU will open with two true road games since 2010. *Will the Clemson home game be at night and with the ESPN Game Day crew on campus for the first time covering a football game? *The N.C. State road game (Oct. 10) and the Pittsburgh home game (Oct. 18) are on Thursday and Friday nights, respectively. Exactly the kind of singular exposure that has helped promote the program’s resurgence. *The calendar provides an overall 15 week period to play 13 total games (conference championship game included), so Syracuse has two open weeks this year, week five Oct. 5, and week 11 Nov. 9. It also means that the Orange will only play one October home game (nemesis Pittsburgh). *The crossover road game is against Duke. It’s the second time the teams have met on the gridiron as ACC members, and the first time Syracuse has played in Durham, N.C. since 1939. *The ACC mixed it up again this season by not placing the Boston College home game as the season finale in the Dome. Instead, the “Rivalry Weekend” game will be against Wake Forest the Saturday after Thanksgiving.